Just in: The results from last week's SUPRA election have been counted. SUPRA held its annual elections on 26 and 27 April. Tickets led by Chinese internationals students have won nearly half of the seats up for grabs in council elections for SUPRA, USyd’s postgraduate student union. At the same time, the elections, which were held on 26 and 27 April, have recorded their highest voter turnout in recent times. SUPRA, the Sydney University Postgraduate Representative Association, represents 26,174 postgraduate students, who can access its caseworker services and vote in its annual council elections. This council, in turn, elects SUPRA’s executive, which is drawn from among the 33 councillors. The executive—made up of a singly or jointly-held presidency, secretary and several other office bearer positions—is charged with implementing SUPRA’s policies and taking care of day-to-day management. A record 66 candidates ran in the main ballot, vying for 27 council seats. Four broad groupings made a showing: far-left tickets Postgrad Action and Postgrad Action for Health received six seats between them. ‘Impact’, a centrist alliance with international student ties, won three seats. HD Reform, which advocates for the rights of students in postgrad research degrees, won three seats. The final grouping is a looser one: four tickets led chiefly by Chinese international students, though comprising both international and domestic students. Of these tickets, Weihong for International won six seats; Team for Continuous Development won four seats; Jarkz won three seats; and Jinghan for Change won two. From SUPRA insiders, Honi understands it is likely these tickets will vote together in SUPRA’s council, including in the crucial executive elections. This year, 1449 postgraduates voted—a sevenfold increase on the 198 who voted in 2016. If the four tickets do work together, they will control 15 votes—just shy of the 17 needed for a majority. In 2017, council was controlled by a broad centrist coalition, which included ‘Impact’ and another ticket ‘Change’. This coalition secured the bulk of executive roles, including the presidency, which went to then-Change leaders Kiriti Mortha and Mariam Mohammad, who did not contest this year’s election. Postgrad Action was the second largest group in 2017, and had some representation on the executive. Apart from the main ballot, six seats were filled at separate autonomous equity elections. In these elections, minority groupings vote for their dedicated representatives, chosen from candidates who share that group’s identity. 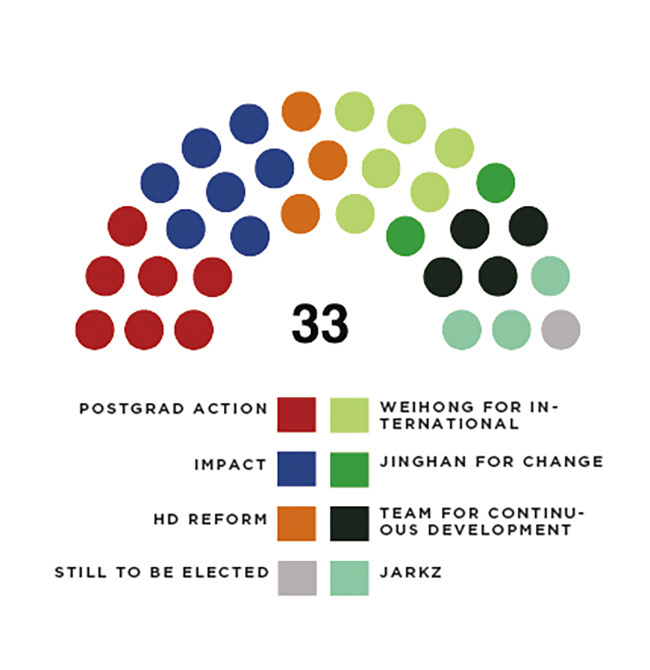 Four equity seats were elected on 18 April: ‘Impact’ candidates took the International and Satellite Campus positions, and independents were elected to the Wom*n’s and Disability roles. Honi understands these two independents will vote with ‘Impact’ in council, bringing that ticket to a total of seven councillors. The Queer Portfolio was initially won by an uncontested joint nomination, comprising two Postgrad Action candidates. After concerns that only individuals could nominate under the regulations, one member of the joint ticket stood down, leaving the other validly elected. That adds one more Postgrad Acton councillor, bringing their total to 7. Elections for an Aboriginal and Torres Strait Islander Officer, the remaining equity seat, remain to be held. At the same time, international student involvement continues to surge—a trend replicated campus-wide. Panda, a Chinese international students’ grouping, holds eight seats on this year’s SRC; three USU Board Directors are international students, and five more international students are contesting the 2018 USU elections. Below is a list of candidates elected to the 2018-19 SUPRA council, as of most recent counts by scrutineers. Councillors appear grouped according to ticket. Results remain subject to any electoral disputes. Elections for Queer Officer and Aboriginal and Torres Strait Islander Officer have yet to be finalised, and so do not appear on this list.